I recently received a review copy of best-selling author Sheila Roberts' new book The Nine Lives of Christmas just released in late October. I'm excited to read it because Roberts' previous work On Strike for Christmas was adapted for the TV movie of the same title which aired on the Lifetime Movie Network in 2010. The TV movie On Strike for Christmas includes a familiar cast with loads of TV credits. 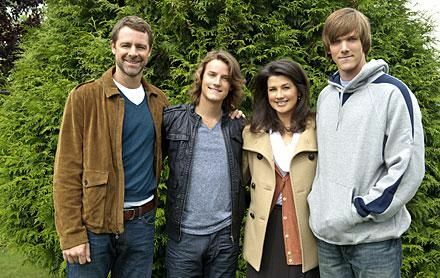 It stars Daphne Zuniga (Melrose Place) as Joy, David Sutcliffe (Gilmore Girls) as her husband Stephen, Julia Duffy (Newhart and Designing Women) as Grandma Erna, Victor Zinck Jr. as the son, Jeremy, and Evan Williams (Degrassi and the Christmas TV movie The National Tree) as the son, Mark. l to r: Sutcliffe, Williams, Zuniga and Zinck. In the days before Christmas, mother Joy Robertson is frustrated and overwhelmed with the amount of work needed to prepare for the family Christmas celebration. She isn’t receiving any help from her husband, Stephen, and teenage sons Mark and Jeremy. Yet the men expect her to bake cookies, decorate the house, trim the tree, and organize two holiday parties on their behalf. Inspired by picketers she sees outside of a local market, Joy decides to go on strike until her demands are met. Her strike gathers attention from other over-burdened wives and mothers and Joy’s story ends up on the front page of the local newspaper. Now publicly embarrassed, Stephen and his two sons begin to take Joy’s strike more seriously as they take up the effort to organize the Christmas dinner, buy gifts and decorate the house and tree. Along the way, Joy learns a lesson about what a perfect Christmas really means. She also has to embrace the fact that when she asks her husband and sons to share in preparations for their holiday, they may not do it the same way she expects them to. On Christmas Eve, Joy is finally willing to settle the strike when chaos fills her house: Stephen’s holiday party for his co-workers is being hosted in the home at the same time Mark and Jeremy’s holiday party for their friends! Adding to the mayhem, television news reporters are on the front lawn asking Joy to comment on the success of her strike and escalating the divisions in the community between women and their families. This TV movie has the potential to be a holiday favorite for female viewers for years to come. It doesn’t just provide two hours of escapist fun but acknowledges a common problem many viewers experience each Christmas. Fortunately, this movie offers the right solution: wives and mothers need to be appreciated more for the long hours and hard work they give to creating the Christmas traditions for their families each year. At the same time, we all need to recognize that the perfect Christmas is never about the trappings but about bringing families closer and spending time together. Check out the official site for the movie On Strike for Christmas. Something else I liked about the movie was that it reminded me of a favorite Afterschool Special I'd seen before: Mom's On Strike from 1984, starring Mary Kay Place. Apparently a similar concept inspired a 2002 TV movie starring Faith Ford. Though On Strike for Christmas is an original story, it draws upon the spirit of personal conflicts becoming public discussions and an openness to ask for change in one's life. The story in On Strike for Christmas also reminds me of the Christmas TV movie Holiday in Handcuffs about a woman who emotionally and mentally breaks under the weight of feeling like she must construct the perfect Christmas with her family. The 2007 comedy movie Holiday in Handcuffs starring Melissa Joan Hart and 2010's On Strike for Christmas remind us that the quest for perfection at Christmas is missing the spirit of the holiday season. Next: I'll review author Sheila Roberts' latest book The Nine Lives of Christmas. Will it become a Christmas TV movie as well?